You are currently browsing lpablogger’s articles. Lake Panorama is likely the largest private lake in the United States. Since it is actually a reservoir on the Middle Raccoon River, much of the lake is made up of the relatively narrow river valley. This makes boating, especially on holidays and weekends, a busy activity requiring observation and care. All of the lake except the main basin (the open expanse near highway 4) is intended for counterclockwise traffic. Centerline buoys mark the approximate center of the channel and boat traffic journeys up and down the lake on the “right” side of the centerline buoys. Be sure that as you travel, you remain on the right hand side of the buoys. If needing to cut across traffic to go to a cove or dock on the opposite side of the lake, be sure to check for traffic coming from the opposite direction, as well as traffic following your vessel. It is better to go “beyond” your intended spot, do a U-turn and then turn right into your intended location. Warning buoys mean just what they say. Shallow areas are marked with buoys indicating dangerous shallows, rocks or rock beds. Although a few of these markers are for specific, individual rocks, most indicate an area of shallows that could shear a propeller or lower unit…an expensive and possibly dangerous situation for your vessel. Coves have speed limits. All coves have marker buoys indicating speed limits. Usually the entrance to a cove has a 10 mph speed limit and further into the cove there will be a “no wake” buoy. Smaller coves go immediately to “no wake.” “No Wake” means just that. Travel slowly enough that only ripples or less follow your vessel. Speed–If vessels are traveling more than 10 mph, a 200-foot interval should be observed. No vessel should exceed 10 mph if traveling within 50 feet of the shoreline, a dock, downed skiers, or parked vessels. Vessel capacity limits–all vessels have capacity limits for a purpose. The size of the people in the vessel has no bearing on the limit as it is the number of persons that count. This is a safety issue that must be observed. As in all safe boating–appropriate (meaning suited for each person’s size and weight) personal flotation devices (PFD) must be available for every person on board. In addition, all persons under 13 must be wearing the PFD if the vessel is under way. 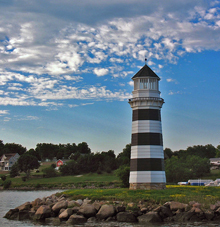 Lighting–Is required for all vessels from 1/2 hour after sundown to sunup. Night speed limit at the lake is 10 mph. Personal water craft (PWC) have a place at Lake Panorama and because of the busy weekends and holidays, there are rules here that are more restrictive than Iowa boating laws allow elsewhere. (Yes, the LPA can be more restrictive than the State for our private access lake.) Primarily, the restriction (in addition to horsepower) is for age of operators. The rules here do not permit youth to operate a PWC even if a responsible adult is on board. At Lake Panorama, all boat operators must be at least 16 years of age, and if under 18, must have passed and have in their possession, the boating safety certificate approved by the State of Iowa. The LPA recommends that inexperienced PWC operators not go out during busy traffic periods. The most common error that could be disastrous is for the operator to forget that PWCs (and all boats for that matter) don’t have brakes. PWC’s are not to be on the water after 1/2 hour after sundown until sunrise. PWC towing a skier–remember, the skier or tuber counts as a passenger (the same for all boats) when it comes to vessel capacity. A PWC rated for 2 people towing, with two on board and one being towed, is over capacity and will be cited for a safety violation. The Narrows area above Sunset Beach has limits on when towing and/or wakesurfing can be done. None of these activities are allowed between 11 a.m. and 4 p.m. on weekends and holidays from Memorial Day weekend through Labor Day weekend. The area is too narrow to avoid downed individuals without slowing considerably and without going on the “wrong” side of the centerline buoys. The Security Supervisor may declare other times “no towing” if dangerous crowding is possible. No towing should come within 100 feet of shore (also why the Narrows has rules). No more than two tube or inflatable objects can be towed by one vessel. No towing is allowed in the Marina area. There is significant in and out traffic here and downed individuals would be in danger, as well as be a cause of additional crowding. No skiing or towing is allowed from 1/2 hour after sunset to sunrise. Canoes, paddleboats, kayaks and sailboats (rare) must consider boat traffic conditions when operating. Coves are the best place for operation during busy times. These vessels must obey the counter-clockwise traffic pattern , if on the main lake. Lights are required at night. These vessels must have boat stickers, invasive stickers, and be inspected prior to launch if they have been elsewhere. Frankly, sailboats are not a good fit for Lake Panorama due to the counterclockwise traffic requirement. The main basin is the only regularly suitable area for sailing, but off-season and off-busy hours are possibly suitable. Every vessel operating on Lake Panorama must be registered with the State of Iowa (if required) and must have an LPA boating permit–either a member permit or a guest permit. Each member vessel that only boats on Lake Panorama is given a green, invasive sticker to go with the boat permit. Every member vessel that goes to other water bodies is declared a NON-RESIDENT vessel and must report to Lake Security (641) 755 3101 prior to every launch. Any vessel is subject to inspection. The purpose is to keep invasive species out of our lake. State law requires plugs be out while transporting boats. A boat should be cleaned, drained of all liquids (bilge, live wells, bait buckets, compartments, etc) and completely dried (including ski ropes, anchor ropes, etc.) Lake Security may deny launching to anyone having evidence of organic material (or just mud) on vessel or trailer or any water in any part of the vessel. There are severe penalties for violating this provision. BE SAFE! It’s the best way to have fun. It came early, which offends no one. The LPA Board passed a set of fairly significant penalties for not getting land disturbing or building permits at their March 22, 2016 meeting. The fines are substantial, but should never have to be enforced…Why? Any private community has regulations and requirements. It’s what makes each community unique. Every buyer/owner in a community should realize that and there are numerous places to get the information about permits, rules and guidelines. The LPA provides an extensive webpage at http://www.lakepanorama.org where non-members can explore the requirements for building and living here. Members can apply for a login on the site and get their information. New member/owners get an extensive folder with lake information including the latest Building Codes. Building permits are required for all structures as defined in the regulations…Since most of the lake is essentially zoned single family residential, the number of structures and their size is simply noted and regulated. Any residential lot can have a home, a detached garage, a storage shed and a gazebo (or alternative to gazebos, a shoreline sun shelter or picnic shelter.) Each structure has size limits and must abide by setback regulations and a few simple architectural requirements. Land disturbing activities also require permits (free) when a project is disturbing more than 1,000 square feet or within 100 feet of the lake, or is establishing or widening a new driveway. Ditches cannot be filled without permission as ditches are necessary for road quality. So, it’s simple…if you want to do a project…contact the LPA. It’s likely you’ll be able to do what you want to do…but there are some restrictions and, with most properties, the restrictions in size are simply practical. Just in case you hadn’t considered it, the LPA doesn’t allow above ground pools, fences are very limited in scope and require permits, beaches have special qualifications due to sand loss and maintenance issues, and buildings with habitable space (finished space for occupancy) require construction inspection. For a complete list, consult the office, check the website, or give us a call. Vehicles traveling on most LPA streets are limited to 5 tons (10,000 lbs) in weight beginning on Monday, February 22. The length of the Embargo is up to Mother Nature. Please note that deliveries of supplies, furniture, or other items must be in a vehicle weighing 5 tons or less total weight, and that loads can be transferred to smaller vehicles at several places around the lake. These locations are shown on the map below. UPS has trucks that are under the weight limit when loaded and will make normal deliveries. FEDEX deliveries (except Saturday deliveries) will be to the LPA office at 5006 Panorama Drive. Those ordering items being shipped by FEDEX can find out if the item has been delivered to the office by checking their package information online. In any case, do not call the LPA office about a delivery at least until after 12 noon as packages will not be delivered there until after that time. Check online first. Pickup can be anytime prior to 4:30 p.m. or by prior arrangement. Call the LPA office if you cannot pick up prior to 4:30 p.m. (641) 755-2301. If after hours, call (641) 755-3101 to arrange package pickup. LPA will notify members of unpicked up packages IF we have contact information. Load transfer areas are shown in the map below. 50 degrees…sounds like paradise after blizzard warnings, ice, slush, frost, slick spots and icy puddles…50+ degrees means something else in late winter at Lake Panorama. It’s time for the embargo. When things start to melt over a several day period, it means that many Lake Panorama roads will be in danger of severe damage caused by heavy loads. Why? All but about a mile of LPA streets are actually chip-seal surfaces. When conditions are dry, they can hold tremendous loads. But unlike full-depth asphalt and concrete highways, the load bearing of the road is based on interlocking, but not cemented together, crushed rock. During the thaw, that layer of crushed rock (sealed from penetration by water from above by layers of asphaltic cement holding together a sealing layer called chip-seal), becomes saturated with water. The water acts like a grease that allows the interlocking rock to move and not be supportive of the layer above. If a heavy load is driven over the area, the chip seal surface, no longer well-supported by the rock below, can give way creating deep ruts and high costs of repair (chip seal costs about $20,000 per mile to fix). That is why the Lake Panorama Association has to declare a 5 ton limit to vehicles during most spring thawing periods. All Association roads receive ZERO governmental dollars for maintenance, it call comes from the assessments and fees collected by the LPA. So the Embargo will come. February 22 is a likely date, which will be announced via the LPA’s website, their e-bulletin system and by signs at every LPA entrance. As an LPA member, help yourself out and be sure deliveries are done prior to the embargo (most delivery vehicles except small vans weigh more than five tons) as well as any materials or propane or other needs you have. The Association must assess repair costs to members who violate the embargo and cause damage..as well as for deliveries of whatever that comes to their homes that breaks up the chip seal and causes road damage. Watch for the official announcement..and check in regularly. Mother Nature is the only one to actually determine the end of the embargo…when drying conditions stabilize the road bed so it can bear loads again without tearing up the chip seal surface. The promise of the season ahead is already formed as the days begin to lengthen again and the winter solstice is left behind. An unusually warm and very wet start to winter will likely mean a long period in February or March (or even earlier) when LPA streets will need to be limited to loads less than five tons in weight. Wet soils usually produce conditions that result in serious road damage without the prohibition by weight. So, as you plan projects and deliveries for later in the winter, keep these in mind. Safety and Security is always a concern at any time of year. The absence of occupancy of around half of Lake Panorama residences in winter means homes that are more susceptible to issues. Although it has been years since a few brazen individuals broke into homes in broad winter daylight to take furniture, high end technologies and other treasures, it is always a good idea to have someone you trust keep an eye on your uninhabited residence. If you don’t have a neighbor or security system to keep watch, the LPA Security department provides a twice weekly service that can check home temperature (to watch for furnace failure and avoid pipe freeze-up) and/or check doors and windows to insure no unwarranted activity has taken place. Call the LPA office at (641) 755-2301 for details of the service. LPA Security routinely patrols all streets in the development. ICE–As of the first of winter, little ice has formed on the lake. Ice is always a safety issue at Lake Panorama because of variable weather and variable ice quality. The LPA recommends staying completely off of ice unless there is at least four inches of clear (not cloudy in appearance) ice to support human weight. Be sure you know ice conditions can vary from place to place. areas with river current can have much less ice than quiet coves and undisturbed open areas. An example–during an exceptionally cold snap, 17 inches of ice was measured near Boulder Beach and on the same day, near the upper end of the lake where river current was active, less than three inches was present. Another reason ice can be dangerous is due to wildlife. The resident Canada goose population can keep areas of the lake open despite extremely cold temperatures. Even in arctic conditions there can be open water. Snowmobiles should only be operated on the ice by experienced operators who know and understand Iowa ice variability, especially after light snows which can mask areas of very thin ice as falsely appearing as solid and safe. LPA members should keep all the materials in the annual statement sent out in mid-December. The 2016 member update is a good reference for updates and resources. The boat permit applications remind boaters that 2016 will require their vessels to have renewals on the Iowa DNR registrations and copies of those renewal registrations are needed before the LPA will send out any boat stickers for 2016. By regulation, your assessments must be paid (or arranged to be paid by EFT) and the boat permit applications completed, in addition to the updated DNR copies, prior to any permits being sent or picked up. CHANGES for 2016 are fairly minimal. Plan ahead for projects at your property. Building or land disturbing permits are likely to be required. Owners must sign all permit applications (signatures can be obtained and sent via fax and email). The 2015 Lake Panorama season is braking to a close. Winter is knocking at the door and outdoor activity winding down. While a number of trees still have a few colorful leaves during the first week of November, the majority of woodlands are now bare and the sound of winter–wind through bare branches–has begun. It has been an eventful year. Weather dominated lake activities with numerous rains and high river flows. LPA maintenance crews scrambled to keep up, cleaning up debris caught by the debris trap after each rain event and repairing and re-repairing road ditches and shoulders damaged by erosion and softened, wet roadbed conditions. Despite river flows ten times the norm for late fall, the routine maintenance work on the LPA dam and spillway was completed successfully and on schedule. We salute the barge companies and the marina who worked steadily in cooperation with the LPA to take care of boat, lift and dock removal ahead of the normal schedule to accommodate the dam repairs. We also thank the many cooperative members who had to further shorten their already shortened boating season to allow the necessary dam work to get done. The winter season for the lake as a recreation area, is a season of rest. If the winter weather cooperates, there will be ice on the lake and snow on the ground. Solid ice will mean a few hearty souls will be snowmobiling (we only recommend it if you are very familiar with ice conditions–there have been fatalities in the past due to lack of knowledge about open water) on the lake and on a couple of routes approved to get from the lake to local road ditches with marked and maintained snowmobile trails. Snow slows most other activity, though, and the main snow activity here is the maintenance department rousting themselves out of bed early or staying up late to clear roads and give members access. Regarding Snow Removal–The maintenance department takes pride in timely snow removal, but doing an effective job requires member cooperation. Here are some tips: 1. Roadside parking must be limited to permitted vehicles. The LPA recognizes some folks have driveways that are almost impossible to negotiate during the winter. We ask members with that situation who desire to park on the roadside, to park as far from the road edge as possible and to let us know you need to do so. Snow covered roads and snow-filled ditches can make finding the road with a snowplow difficult. When snow depth increases, the department must “wing” snow away from the road edge to prevent drifting. To do so means vehicles must be away from the road edge. Those who must park along the road realize the potential of getting “plowed in” which is almost unavoidable when the crews have over 70 road miles to clear. 2. Visibility around snow plows is notoriously poor. Blowing snow and thrown snow can block vision along with “snow blindness”, eye fatigue coming from hours of gazing into an all white world. Give snowplows plenty of room. Watch for backing vehicles in cul-de-sacs and stay clear. 3. If at all possible, don’t get in a hurry to leave. If the road has not yet been plowed, waiting will allow the plows to go by and this will reduce the amount of packed ice and snow from early travelers. 4. When cleaning ones own driveway or hiring it done, snow should not be plowed into the street. A pile of snow can cause an accident or loss of control and the homeowner could be liable for creating a hazard. Have snow pushed onto your own property and away from the street. As December approaches, the LPA Administrative staff will be working hard to ready the 2016 statements for mailing. This can’t be done until the final budget and rates are approved by the LPA Board of Directors. Watch for information about boat registration for 2016. 2016 is the year for the Iowa DNR registrations to be renewed for all vessels. The LPA will not be able to send out boat permits until the office has received or made a copy of your 2016-2019 Iowa DNR Boat Registration. The LPA has no control over the individual county offices that issue the registrations. Check with your county recorder to see when registrations will be available. The sooner you have yours, the sooner the LPA will be able to provide your 2016 permits. As always, permits will not be sent until either the 2016 assessments are paid or arranged to be paid by Electronic Fund Transfer (EFT). Forms are available on the LPA website at http://www.lakepanorama.org . Winter House Checks–There is still plenty of time to sign up to have your home checked by the Security department while you are gone this winter. Fees depend on the level of service and monitoring requested. There are two options. Call the office. Members leaving for the winter should give the office a call (641) 755-2301 and arrange to have the water shut off at the street for the winter season. We also recommend closing the water supply valve as it comes into the home. The LPA water department offers to do this service once a year for no charge. Additional services are charged on a per time basis. We are thankful that the bacteria tests taken Wednesday and Thursday after the water leak on Tuesday, October 6, were both clear which allows us to rescind the boil advisory for drinking and cooking water at Lake Panorama. What’s new–the lake is at its lowest level for now (October 9). The dam’s bascule gate will be raised late Sunday or early Monday to allow the spillway to dry for workers to do their routine repairs on the “dry” spillway. River flow is eight times median flows for this time of year so there may have to be an additional lowering of the lake to give workers more time to complete repairs. Fall color is finally showing up. Subdued this year due to much rain and cloudy weather, it finally woke up as the sun has poked through this week. The bright yellows are mostly green ash…the deep purples…white ash. Both of these trees are threatened if the emerald ash borer makes it to Guthrie County. You can do your part by not transporting firewood across county lines and not bring ash tree nursery stock from other counties where infestation may already have occurred. The LPN is currently planting trees grown in their nursery in preparation for losing the many green ash that line the course. Several other species are being planted. While the lake is down is a great time to check the lakeshore riprap. Often one can see plenty of rock that has “oozed” its way into the water leaving less than needed on the shoreline. To remedy this, re-shaping the shoreline to a broader slope is recommended. The shoreline will handle lake ice better and there will be less downward pressure of the rock stacked for protection. Be sure your contractor (or yourself) finds the proper erosion fabric for the backing of your rip rap to prevent soil erosion behind the rocks. This is critical to long-term viability of rip rap. One can also note that field stone (granite and other boulders) lasts much longer than most limestone type rip rap shorelines. (Special grade limestone does last longer as its denser and less easilty weathered. Of course, it costs much more and is not available close by. Another note: fieldstone is often more attractive, as well as longer lasting. Due to a leak that created loss of pressure in a large area of the system, a “Boil Advisory” must be issued. When water pressure is completely lost, there is some potential for contaminants to get into the water system. This means it may not be fit for human consumption but is OK for showering, washing, dishwashing, etc. We recommend your participation in taking this precaution. Bringing water to a rolling boil should handle any organisms present. This means that water should not be used for drinking or cooking without being boiled first. (Note: new ice from automatic icemakers should not be used for drinking.) This applies to all users on the water system as water conditioning and softening systems do not function to treat the water for potential pathogens. The advisory will remain in effect until bacteria tests show the system is clean. We will issue another bulletin as soon as that happens. Due to water loss, there will be air in the system until it can be displaced by water. Open a faucet or two to help release this air. If it lasts longer than several minutes, please call the office at (641) 755-2301. Staff will begin flushing hydrants to release the air throughout the system as repairs are finished and water tower levels restored. Be cautious doing laundry as sediments will likely be stirred up due to the leak and flushing and staining could occur if you don’t have filters. Water service should be restored to most areas by the end of the day. At this time, the advisory could last as long as early next week, but, as soon as two consecutive bacteria-free tests are received, we will issue an end to the advisory. There will also be public notice of the advisory through the media. Where did the summer go? It has been an unusual year at Lake Panorama. Rains, heavy rains, have seemed to be the norm…both on the lake itself and in the watershed of the Middle Raccoon River. The lake is being lowered for repairs on the concrete spillway. Most boats and lifts have already been removed from the lake, but if you’re still planning on trailering your vessel to the marina and doing some late season boating, remember the following: the navigational buoys are out and there are new, unmarked hazards at lower water levels; the debris boom is out and rain events may bring debris into boating areas; don’t travel too fast as wake could possibly erode shoreline at lower lake levels. Fall Yard Clean-up–Burning of leaves is allowed on your own property, as long as its supervised, within your property lines, not in a drainageway, ditch or gully, and it is done when wind and weather conditions are safe and non-hazardous to your neighbors. Despite Mother Nature’s actions, it’s illegal to rake leaves into the lake. If you choose not to burn, the yard waste sites are for you. All leaves can be taken to the yard waste sites on Wednesdays through Sundays from 9 a.m. to 7 p.m. The sites are closed for maintenance on Mondays and Tuesdays. Leaves go in the mulch pile areas as they cannot be burned when collected at these sites due to Iowa DNR regulations about smoke. Anything that grows on your lot can be taken to the yard waste sites except wood greater than 12 inches in diameter, root balls, and stumps. (These don’t burn at all or don’t burn fast enough to keep from causing smoke issues.) There is a specific area for burning wood (not leaves). Look for signs that give directions. Be sure you don’t take anything else to the yard waste sites–lumber, construction materials, garbage and trash are No-Nos. Shorelines–Lakeshore owners should take advantage of the lake being lowered to check out the condition of their riprap. If you see signs of erosion, exposed and weathered fabric backing, slumping or other signs of deterioration, its time for repairs or renovation. Obvious cases of poor riprap will likely be getting letters to repair the problems. Fall Golf–Not everything is work at the end of the season…golfing at the LPN or Panorama West is beautiful this time of year with crisp days, sunshine, and bright colors. Getting ready for winter–Going to be gone this winter? You can engage the Security department to check your home for temperature (to prevent freezing) and for signs of disturbance while you are gone. The water company recommends you give them a call and shut your water off at the street when you will be gone during normally cold weather periods. One cycle of turn-off/on is done for no charge annually. It is also recommended to shut the water valve off at the water meter. When members come back in the spring, the water company asks someone to be present when the water service is restored, just in case frozen pipes were broken when the water returns. The water company will be flushing hydrants on weekdays From October 19 to 30. Just in case, its important to check water conditions prior to doing laundry as the flushing often stirs sediments that could cause staining to whites and delicates, especially. Above all, enjoy the fall…be safe…take your time…and enjoy Lake Panorama. Routine maintenance on the Lake Panorama dam is a very high priority. The LPA hires a qualified engineering firm to review the dam and its various aspects on a regular basis. As announced earlier this year and noted a year ago, routine maintenance on the concrete spillway of our dam will take place this fall. For perspective, this will be just the third time this has been done in the last 20 years. Plans are to lower the lake four feet by lowering the bascule gate of the dam for the project to begin on October 1. Lowering the lake level is needed to prevent water from going over the spillway so repairs to the spillway floor and walls can be made. At that time the low autumn flow of the river will be diverted through what is called the “low flow tube” in order that the lake level does not rise to again flow over the spillway. The spillway has to be dry for the repairs to be made. Repairs mostly consist of sealing cracks and repairing spalls–areas where the concrete has broken off or where imperfections in the concrete causes a small area to “pop out.” These areas need to either be filled or smoothed depending on the engineer’s analysis, for the spillway walls and floor to remain in excellent repair. Cracks are sealed to prevent water infiltration and freezing damage. The timing of the project cannot be delayed to help insure the outdoor temperatures are high enough for the concrete and sealing repairs to properly cure and be effective. Improper temperatures would only cause the whole process to have to be repeated soon. Avoiding that situation is also a priority. Since there is no way of predicting what weather will do, the lake level may not return to normal in 2015. Boats on lifts will have to be removed prior to October 1 or they could possibly be stranded and endangered by ice and water level changes in the winter. Lifts and docks that are normally removed each winter, should be out prior to October 1 for the same reasons. IF the water level does not come back up after repairs are finished, the boating season will be completely over. Members desiring to do minor work on lakeshore riprap, may have an excellent opportunity to see the condition of their shoreline and possibly make minor repairs while the water is down. This is an inconvenience to some members, however it is also an inconvenience to our own dredging department as dredging during this time must be either curtailed or highly modified which will cause delay in the completion of some areas. A meeting between the Marina, local barge services, and LPA departments is being scheduled to encourage coordination in the timely and important removal of boats, boat-lifts and docks in time for the project to be completed. It is possible that the timing will work well, the repairs completed and the lake return to normal pool prior to winter and still make a few isolated days of boating possible. It may also occur that another wet fall would make impossible the lowering of the lake for a long enough period to do the repairs. Let’s hope for the best! We are at nature’s mercy. Thanks to all for your cooperation and understanding.